We've mentioned the forthcoming Xbox Live Vision camera in the past; it's supposed to drop next month, but as always, there're leaks. Big leaks. Like this guy who walked into his local Toys R Us, which apparently confused 9/18/06 and 8/18/06, and walked out with a nice shiny camera. Who benefits? We do, via Flickr. Also, Gamasutra has a report from the Gamefest Expo, where they got to try out some of Vision's neat tricks: such as the ability to create a gamer icon based on your appearance. 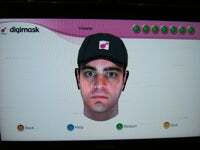 Using a technology called Digimask, it takes video of your face from the front and the side, and then pulls from these images to create a mask of your face that looks around, blinks, and can even be changed to show emotion. It's fairly impressive, except for the angle shots that seem to require a little more interpolation. Guess it's only a matter of time before people are filming other things to use as their profile icons. Like, um, their cats. Yeah.